Website and processes: 11 Nov 16 Heather, 5/5 Excellent "Simple and easy to follow! Easiest birthday present I ever bought! " 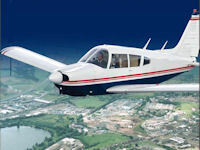 This package consists of a short pre-flight briefing conducted in the classroom, or the aircraft, followed by a flying lesson of approx 30mins with a qualified flight instructor to a local airfield and then, after a short break, back again to Blackbushe. You will get a chance both to fly the aircraft and to enjoy views of the countryside. Price includes the services of the instructor, landing fees and insurance and the hire of the aircraft. Should you decide to learn to fly, these lessons will count towards your Private Pilots Licence. Once you get the 'flying bug' you can progress to the full PPL (Private Pilot's Licence) course. As long as you are reasonably fit, there is no age limit. You need to be over 13 yrs for the time to count towards your training.